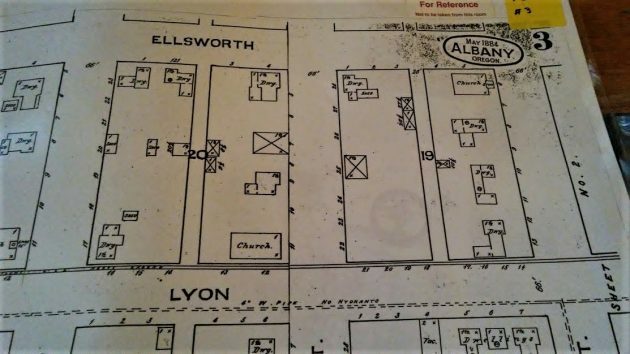 This 1884 map by the Sanborn company, on file at the downtown Albany library, leaves no question how Lyon street should be spelled. I made that point the other day in a response to a reader’s comment, which in turn prompted another reader, Tom Cutsforth, to take up the topic. He wondered about the origin of the name and thought it may have been based on Lyons, the maiden name of the wife of one of the Hacklemans, among the original settlers of the town in the 1840s. Whatever the origin, Albany records easily available to the public at the downtown Carnegie library make it clear that as far back as the records go, it’s always been Lyon without the “s”. Next, I pulled out Polk’s Linn County Directory from 1913. This one has a list of Albany streets, among them Lyon without an “s”. The city directories are in a room in the library’s basement. Now climb up with me to the main floor. There, against the west wall there’s a shelf with maps published by the Sanborn company, an invaluable resource for anyone interested in what was where in the Albany of old. The oldest map is from 1884. As the photo above shows, it has Lyon without the “s”. The map of the same area from 1888 shows the street the same way. 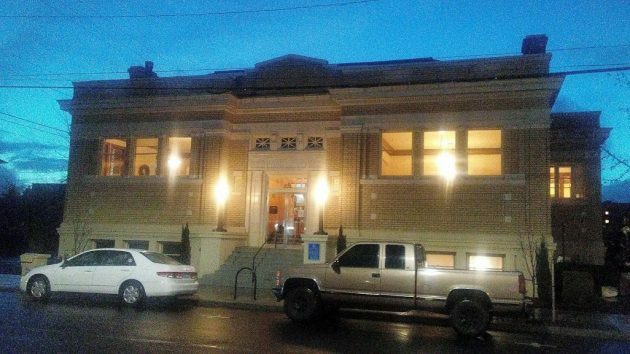 The downtown library on Dec. 20. It’s always a great source of historical information. Do you correctly pronounce Geary Street like Gary, or gear-y? Gear-y is how I’ve always heard it. Why do you ask? I consider Lyon, the street leaving Albany as ‘out like a Lion’! What harm is done? As you say probably none. However, after spending 27 years in law enforcement I can tell you that if on officer issued a traffic citation which occurred at a certain location on Lyons St. the recipient could probably get it dismissed since there is no such location. Therefore, the addition of “S” is important. In this day and age, many, many people say anyways, with an s. That is wrong. The word is anyway. Hate to break it to you, but all those people using “anyways” are correct… it’s a word. The Oxford English Dictionary has citations for it going back as far as the 1200s, and Merriam Webster has a whole page online describing its usage and place in our language. Mike S: I do NOT hate to break this to you: Quoting from Grammerly, a grammar check site online, “”Anyways is almost universally regarded as being incorrect and not fit for print or publication.” Webster’s New Collegiate Dictionary lists anyways as a non-standard and inferior variation and archaic and out-of-date. So you are going to believe grammerly over Oxford English Dictionary? Seems legit. But sure, it’s almost “Universally regarded as incorrect”… except apparently by the most used dictionary in the English language. It’s not like Oxford English is respected or anything, better to trust software developers like grammerly.com, that makes total sense. “Archaic” means that a word or sense once in common use is found today only sporadically or in special contexts. But it’s still acceptable. “Nonstandard” is used for a few words or senses that are disapproved by many but that have some currency in reputable contexts. Again, this means it is acceptable, even if shunned by many like yourself. And then of course there’s Bryant Park, which I used to regularly hear referred to as Bryants Park. Well now, I guess I was “reader”. Oops. I read this article days ago and didn’t realize this “reader” was me, for shame! I didn’t get a notification or anything so I didn’t know you had replied. Glad I could inspire, and thanks for the correction and history lesson. My superfluous “s” was a direct result of mnemonic device to recall which street “leaves” Albany (lions are leaving) as I wrote in my other comment.